Waldemar Januszczak takes a fascinating look at early Christian art. It seems for the first centuary there was no art to speak of, only symbols, such as ROTAS squares, Chi Ros, the anchor, the fish, and very rarely, the cross. When representations of Jesus first appeared in Italy, it was not the bearded Jesus familiar to us, but a boyish Apollo-like figure preforming miracles and bringing sweetness and light to all. The early Jesus is hermaphroditic. Not until Mary appears (borrowed from the Egyptian goddess Isis) does Jesus become masculine. Even then, the beaded adult Jesus does not appear until Constantine makes Christianity the official church of the Roman empire. Dark ages Jesus is Zeus like and presides over all. The tortured Jesus does not show up until the Middle Ages (and I would love to know when the tortured Jesus shows up and what the political developments were and which pope was in business). The Zeus-like Jesus is a feature of a state church where God is there to scare people and keep them in line. If they wanted mercy they were to pray to Mary or some other saint. Which raises the question, what happens then the Protestant Reformation comes along and Mary gets pushed aside? 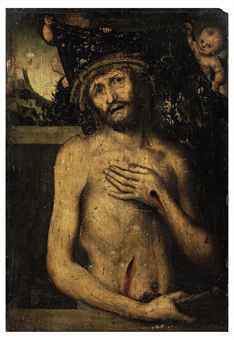 So far as I am aware, Lucas Cranach is the first Prosteant artist to represent Jesus, and we still have the suffering Jesus. We also get baby-kissing Jesus and merciful Jesus protecting the adulteress. Protestant Jesus tends to be more alive, not on the cross like medieval Jesus or the angry Zeus of Dark Ages Jesus. Go forward into the 17th century and we get Rembrandt’s tender long-eyelashes Jesus. Now in modern times we have the kitschy praying in the Garden of Gethsemane Protestant Jesus. Diana Rigg, a star of the London theatre breaks scene, will be appearing in Pygmalion when it opens later in the season. She will take up the role of Mrs Higgins, alongside Rupert Everett (Henry Higgins) and Kara Tointon (Eliza Doolittle). I saw Rigg as Liza Doolittle years ago and she was absolutely brilliant. I am sure she will make a splendid Mrs. Higgins. England has such a wonderful theater scene.